This is a simple case of disbelief. How did this 25-year-old truck survive to the modern day in such amazing condition out here in Rustopia? It’s not quite showroom fresh. The front bumper is pockmarked with rust bubbles and some of the paint has peeled off the wheels. Inside, sun has discolored the back of the headrest and repeated application of a driver’s elbow has discolored the armrest. And lookit that Indiana license plate. This truck isn’t just passing through from less-rusty climes – it lives here. Was it Grandpa’s, and now grandson is treating it with tender loving care? Or is Grandpa still alive and driving it, and only takes it out on nice days? Or did a hole open in the space-time continuum and this truck drop out of it? Wow, that is a survivor. These were all over Southern California back in the day, less so than the Toyota but definitely ahead of the S10 and Ranger. They looked good, appeared solid and I’ve always wondered when one would have its day here. It looks like that time has come, Good find, Jim! These are lovely trucks indeed and while they are quite common in Los Angeles I do not see them in Portland as much. 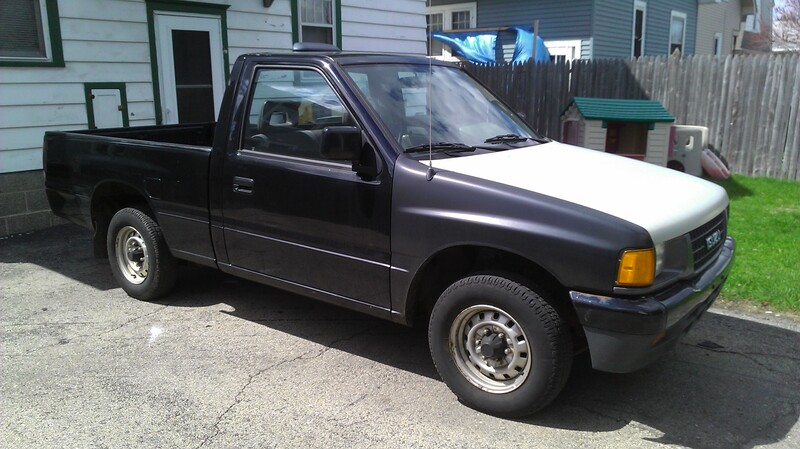 A former neighbor of mine in Central New York has a 5 speed 4 cylinder 1986 Hardbody sans AC that has always been a daily driver and trailer hauler. He does almost all his own repairs, repaints, and puts pine tar on the under carriage to protect it from rust. Problem is though that his truck is probably one of the oldest daily drivers in the entire county so parts can be hard to find at times and occasionally I have driven him and his wife around for a few days until parts can be shipped across the country. These are a rare sight in New England as well. I see a lifted, gutted (and miraculously rust-free) one in my neighborhood sometimes. Boy, this truck would be useful to haul stuff. A bonus is that you don’t need to haul a ladder around just to put stuff in the bed. Ah yes, the inevitable “old trucks are one step away from divinity, modern trucks are infernal” comment. the inevitable : ” you’re too stupid to know what you like ” comment . I think sleeping dogs should be left sleeping otherwise they get woken up and start barking if you catch my drift. In my experience, very few dogs, when awoken, have any bite behind their bark. The exaggeration used in my reply was for the purpose of hyperbole, but probably should have been left out. Personally I tend to not respond to comments similar to Bob’s since I cannot think of a comment that would positively add to the article. Old trucks have their perks and so do new trucks. Old trucks have their downsides and so do new trucks. While it is true that many dogs do not have (much) bite behind their bark the barking alone can become very annoying so I still prefer to not wake said dawg. Yes, I should know better than to respond to certain comments, especially when I’m supposed to be working on finals, but I just can’t help it sometimes. My apologies then Sir . Yes , unlike the trolls , I always sign my name no matter how foolish or obtuse a comment I make , I stand behind it . My friend was given one of these with the NAPS-Z engine after ‘ Tune Up Masters ‘ (!HAH!) mixed up it’s 8 spark plug wires and couldn’t figure it out , he brought it to me and I sorted it then tuned it properly , it was a nice little truck with loads of power and ran quietly . 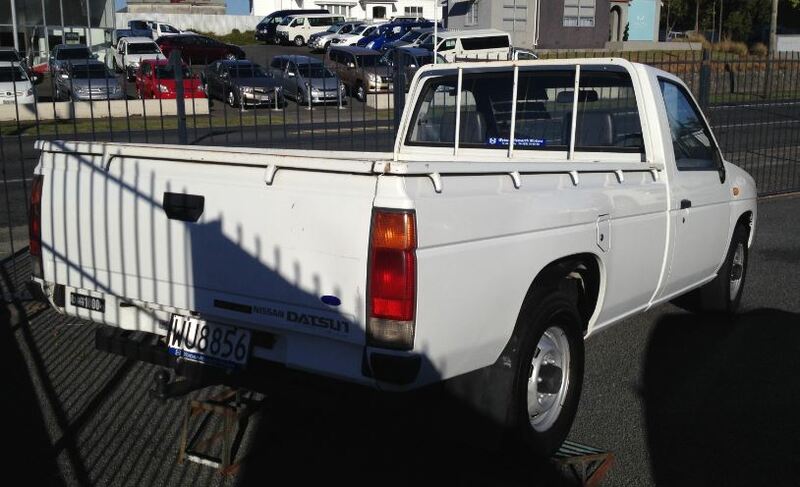 I seem to recall these were the first Datsun trucks with the double walled bed (?) . He didn’t like it and I didn’t want it so he gave it to an Elderly Mexican neighbor who was delighted and as far I know , still keeps it washed and waxed , loves it . Again , my abject apologies . Nate: Owned an81. The style was 80-84 maybe and it was a single walled bed. Owned an 87which was 85- whenever and it was double walled. Both good trucks. 81 was a Z22 and the 87 was a Z24. I think the engine change was before the body change. 83 or something. Then again, a truck that can haul twice as much with a lot more interior space and comfort while getting similar gas mileage, well, that isn’t so bad either, ladder or not. Indeed these trucks were all over Southern California back in the day. The were especially popular with the Latino population. Good trucks. The only weak point I recall were exhaust manifolds. Even though a stick shift would be my choice, that’s still a well kept useful example. I never understood their attraction! A yoda or mitsu was in the same price range and much better small trucks in the 1980’s and 199@’s. Good find. There is some personal interest here. About 4 years ago I parked one of these in the back pasture with almost 350 kmi. It was in very good shape and driven until shortly before that. I had put it into the high school auto shop class for a head gasket and then let them do the whole engine. It ran 1300 miles on their rebuild and froze. It was on it’s third engine when it froze up. Kids were the reason for the first and last engine. The one in between was the one I put most of the 350k on and it was a junkyard engine for $700 including installation. Just gave it to my farrier who wrecked his identical truck. This picture, if it loads, was taken just a week or so before it froze up. 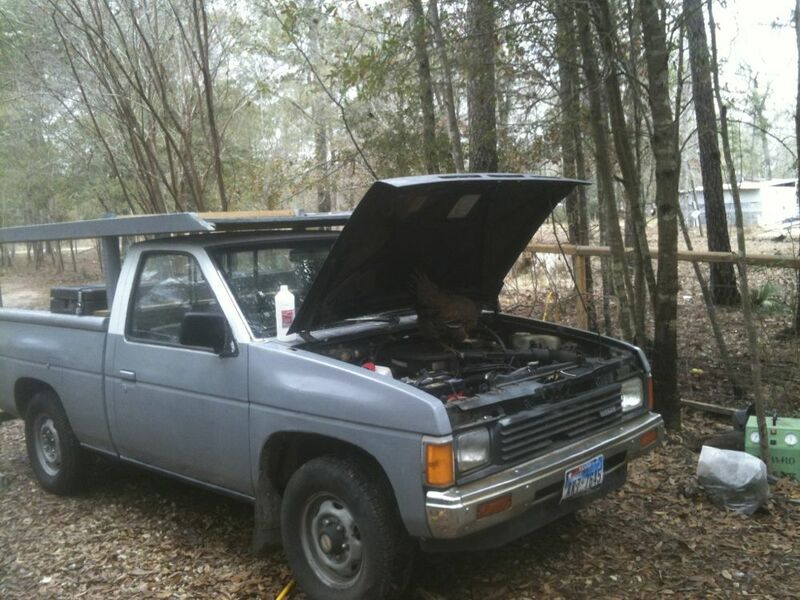 It has my redneck air conditioning over the cab and a hitchhiker chicken under the hood. I have driven 3 Datsun/Nissan trucks about 3/4 million miles doing air conditioning. The 79 was all cast iron and wore like it. The 81 Datsun and 87 Nissan had NAPSZ engines which were 8 plug 4 cylinders. Head aluminum and steel block . Mechanics tell me it is the mating of the aluminum/steel that makes the head gaskets so fragile. The head gasket is the only part that doesn/t last longer than the law should allow. I am retired now so carry a trailer when I need a pickup bed. Not a major inconvenience to drive an old 4runner with cold AC. This pickup will probably outlast the drivers desire to keep it unless the head gasket blows. I hope something similar won’t happen to me. I’ve been searching for a good used motor for my 1993 Toyota pickup with 201,000 miles as the head gasket started to leak and I didn’t find one. I ended tearing it apart with friends to replace the head gaskets, the leaky oil pan, the clutch and the front oil seal in the transmission… The rusted bolts, dry plastic connectors that disintegrate when you touch them and dried hoses make it quite a complicated job as I need to find a lot of replacement parts… I didn’t have the money to fully rebuild it. I hope I won’t regret it! My guess would be that the owner just moved from the west coast, or the truck was recently inherited from someone in a non-rust-belt part of the country. The 4×4 King Cab with the 31.5 tire package was a great looking truck. So was the first Pathfinder. 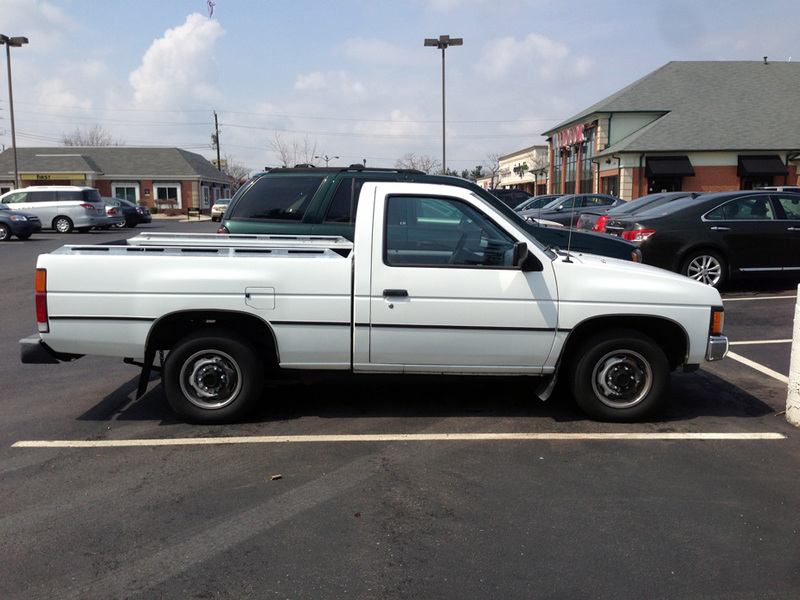 Glad to see some compact pickup love. These and the coeval Isuzus are the best looking small trucks by far. I like the Frontier (PRE FACELIFT) also. The KA 2.4 engines in these are seriously good for a base truck engine too. Nissan doesn’t get enough credit, but in the late ’80s and ’90s you could almost always count on them to give you a gutsier standard engine compared to the competition. As far as the rust-free bed, I think the Hardbody generally was a cut above the competition, even Toyota. 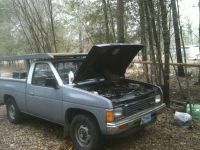 Speaking of Isuzu Pickups, here is my ’94, awaiting reliably decent weather so I can paint the front clip. So how did this seldom-seen truck survive twenty years in Wisconsin with absolutely no rust? By rear-ending a Range Rover in 2002 and spending the next 11 years disassembled in a garage. This Hardbody Nissan is in excellent shape. There are still quite a few of these on the road in this area. Few of them look like this one. There’s still quite e few of these around in Curbsidelandia; in fact I only recently stopped to shoot one because I realized they are getting a wee bit old; at least for the standards of other parts of the country. As sort of a “city slicker” pick-up, it seems perfect for the Baywatch scene, and aptly perfectly named for the role. Yes, it was one of the first fruits of NDI, designed under Jerry Hirshberg. Here is a photo of one of those Hardbodies and I wonder if any survived to 2014? You are remembering right Paul and I see there is a pic above. 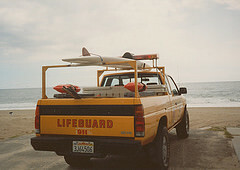 LA County Lifeguard had them. A fixture for years at the Redondo, Hermosa and Manhattan beaches. These did rust fairly quickly,I remember taking one in on trade that had lived in Key West all it’s life, and driving it back to Miami, it had pretty significant rust just from living in a salty air environment, I remember driving it back at night on the overseas highway, it was a really base 4speed truck, it didn’t even have a tach, just a big gauge that read NISSAN on it. We have one of these where I work its the workshop beater,1990 Nissan Navara, Diesel engine, no turbo, 5 speed tree shift, indestructable. We also have a 4WD Terrano for pulling the on site fuel tank also in diesel 2.7 turbo 5 speed floor shift. “HARDBODY” was a chuckle inducing name for me when these were new. Although I thought the 4×4 versions were attractive in a way the 4×2 were not. It sounds like you know Hardbody was in reference to the bulging muscles (fenders) on the truck. Some younger folks I’ve talked to remember the name but think “Hardbody” meant harder steel in the body. That’s hilarious. How did those commercials go over? Well here is one of the ads. This is the ad with all the subliminal messaging. Subliminal? It couldn’t be any less subtle if the entire thing consisted of crotch shots. 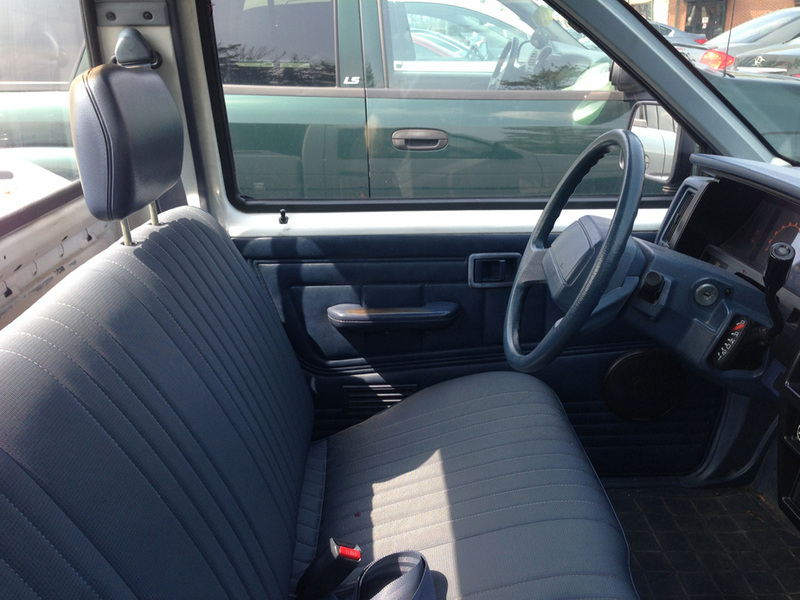 Also, I see that in 1986 a passenger-side mirror was still optional equipment. I think Ford made the passenger mirror standard the next year on their new F-Series, even if the standard mirror was the little plastic one off the Ranger. These trucks are still all over LA and the rest of SoCal, although the majority of them are beat to hell, they still soldier on as workhorses. These were big during the mini truck trend of the late 80’s-mid 90’s. Tough little trucks these things are. The only small trucks more seen here are Toyotas. I’m glad you posted this photo Scott as I was trying to remember the difference in the bed sides. One main difference is we didnt get the swb version featured here. I knew a guy that had one and saw it around later for probably 15 years overall. The 2.4 is a pretty good engine. The only one I drove was a later 1990s version with the V6. Thank you for this article and pics Jim. I sincerely feel that it reflects very well on an owner who can maintain and preserve a meek vehicle like this Nissan for so long. It isn’t easy, and it shows the owner’s patience and tenacity, amongst other good qualities. Whether they are young or elderly. Especially, in a harsh climate like Indiana. I say good on the owner! 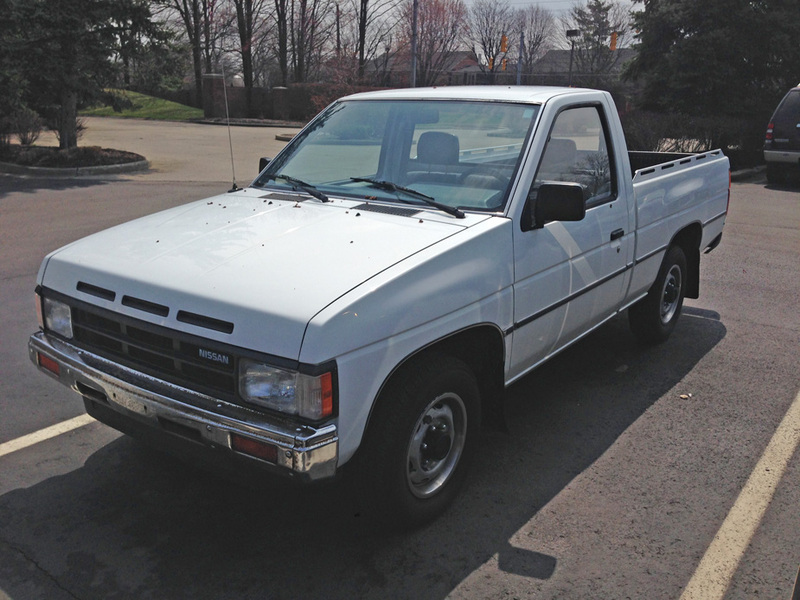 The 1984 Nissan/Datsun trucks were the first with double wall beds. My ’85 Nissan had a double wall bed and standard 5 speed. The 2.4 liter NAPS-Z engine was pretty stout. I carried everything I own in the back over the mountain passes from Seattle to Iowa City a few times and it never faltered. And they are still all over Seattle. look at that, a small pickup with six lugs. I saw one the other day at one of the parking lots in my university, where construction workers currently park while they build some new dorm halls, and saw one of these and had to go back to count the lugs. Didn’t know they used six on such a small truck. Quite a few interesting CCs at that lot. Isuzu (before they were S10s) and Mazda (before they were ford Rangers) also had six lugs. For the most part they were interchangeable but the Mazdas had a slightly larger hub. I have also run six lug chevy 15 inchers on an old Datsun. Wont work on the hardbodies. The Nissan hub is too big. I knew two co-workers who had these, both of them 2WD, in mouse grey with the optional 3.0 liter V6. At a quick-lube place I used to work at, one of our regular customers was a cute Filipina who had one in an odd shade of orange. Great find, JG – have not seen one of these in a long time. I never warmed up to these because my Dad had bought an 81 Nissan King Cab pickup and that, to me, was what a Nissan truck was supposed to look like. This one was so new and different and I thought the “hardbody” descriptor was just stupid. However, these certainly outlasted my preferred style of Nissan pickup. I must say that despite my initial negative feelings towards the name, I’m not sure anyone has ever done a better job coming up with an informal name that perfectly describes an entire generation of pickups. 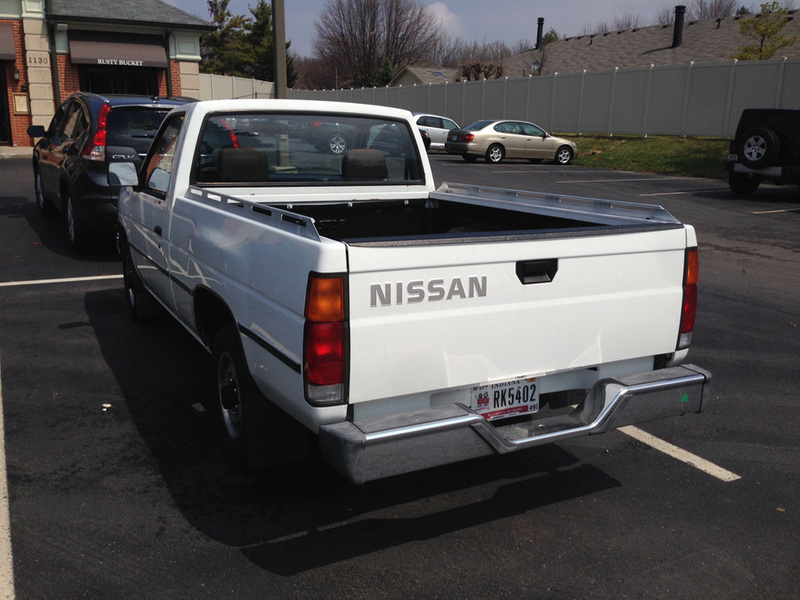 My sister bought a Nissan pickup when her kids were little. When I was trying to figure out which year and what it looked at, all she had to say was “a hardbody” and I knew exactly what she was talking about. Masterful. My father in law has one; I’ve never asked him the exact year but I think it’s an early 90’s model. 4×4, metallic blue with a very 90’s stripe package, not sure if it’s the KA24 or the V6. Tough little truck. He replaced it as his DD about 4 or 5 years ago with an ’06 GMC Sierra, but he still uses it as a hunting truck and for hauling stuff that he doesn’t want to potentially mess up the “new” truck. I’ve never gotten underneath it, but it doesn’t look rusty–eastern North Carolina has pretty mild weather though so that doesn’t surprise me. Things don’t rust easily there. I bought the SE-V6 King Cab model new in ’88. Loved that truck over the next 13 years – took it to 250k miles before fatherhood kicked in and airbags and closed storage became necessary. Apparently the V6 5 speed model was highly coveted south of the border…it wasn’t out for more than an hour next to the highway with a sign on it when the first caller paid $2500 cash. The only major issue I had with it was ac condensers…it went through three of them. Took it to 46 out of 48 contiguous states. Of note – when the Hardbody style came out in ’86, I just HATED the front design with the three fake louvers over the grille. Not that it grew on me – I covered mine up with a bug deflector. But in test drives, it felt more substantial than either the Toyota or Isuzu SpaceCab.